But winning just wasn't enough for one Dirty Birds fan. While Ryan and Julio Jones mercilessly beat the cheeseheads on the field, one fan mercilessly knocked the foam cheese off actual heads. 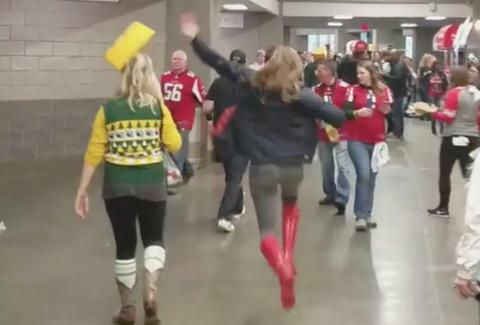 At least five times during Sunday's action in Atlanta a woman ran up to a Packer fan and knocked their cheesehead to the ground. We know this because her friend recorded these cruel acts of cheese harassment and posted them to Instagram (@atlpackman). Some victims laughed along and had some fun with the harmless prank (even if it was a bit mean-spirited). Others did not enjoy the "joke" all that much. It's nice to see some people laugh about it, but it was a damn cruel joke. These folks traveled a long way to have their season ended. Give 'em a break. It's going to be a long, sad flight back to the land of New Glarus and cheese curds. The Instagram posts have been replaced with the same videos as shared on Twitter.